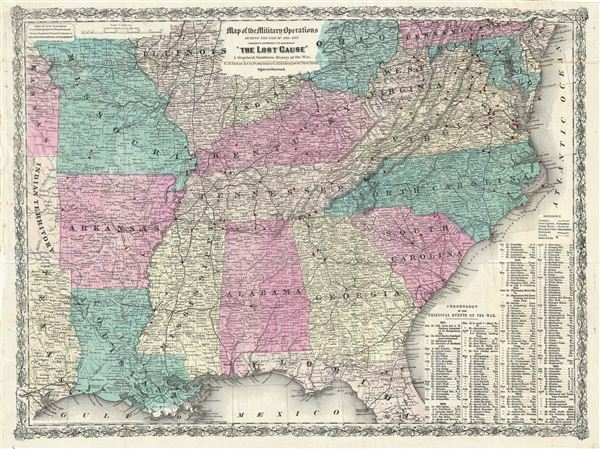 Scarce American Civil War map illustrating the Southern or Confederate States. Map of the Military Operations During the War of 1861-1865 designed expressly to accompany 'The Lost Casue' A Standard Southern History of the War. An interesting and exceptionally influential 1867 post Civil War movement map of the Southern States drawn for edward A. Pollard's book The Lost Cause. The map covers from Ohio and Pennsylvania to central Florida and the Gulf of Mexico and from Texas and Arkansas eastward to the Atlantic. The sites of various Civil War battles are marked in red. In addition that map identifies major cities and towns, roads, canals, and railways. Topography is rendered by hachure. The map is surrounded by a decorative vine motif border. A textual chronology of the Civil War appears on the lower right quadrant. The upper right hand quadrant includes an advertisement for 'Colton's Geographical establishment' at 172 William Street, New York. This map was specifically commissioned by Pollard and his publisher e. B. Treat, to illustrate The Lost Cause. Pollard's book marked the rise of a post-war southern sympathist movement of the same name. The Lost Cause movement was an apologist ideology that became popular among southern whites facing Reconstruction and the Confederate defeat. The basic tenants advocated that (1) Confederate generals were icons of southern chivalry, (2) that Union generals were cowardly and morally bankrupt, (3) that battlefield losses were inevitable due superior Union numbers, (4) that battlefield losses were also the result of treachery, (5) that states' rights not slavery were behind the succession, (6) that the succession was a constitutional reaction to northern attacks on the southern 'way of life,' and (7) that slavery was a benign institution. What most modern scholars decry the Lost Cause movement as a 'use of white supremacy as both a means and end,' it was in fact an important stage in the development of the 'New South' including a new business model and cultural ethic. Pollard, E., The Lost Cause; A New Southern History of the War of the Confederates, (New York: E. B. Treat) 1868. Vewry good. Original fold lines.